You will always find the latest issue on this page. Recapping for our newest members, “Buy an Acre” is a campaign of the First Aero Squadron Foundation (FASF) to raise money to purchase a 160-acre parcel of land that contains a part of the original landing field (and it was simply a desert expanse in 1916—not a runway) and flight line used by the First Aero Squadron during the 1916-1917 Punitive Expedition. The latter military operation was ordered by President Woodrow Wilson in retaliation for the invasion of Columbus, New Mexico on March 9, 1916 by Mexican revolutionaries under the command of Pancho Villa. The First Aero Squadron Foundation already holds title to an adjacent 60-acre parcel containing the rest of the landing field and flight line. The area is landmarked on the U.S. Department of the Interior National Register of Historic Places. Despite its historic designation by both the State and Federal Government, the property has been threatened by inappropriate development and, in fact, the 1916-17 Aerodrome was cited as one of New Mexico’s “Most Endangered Places” by the NM Heritage Preservation Alliance in 2007. 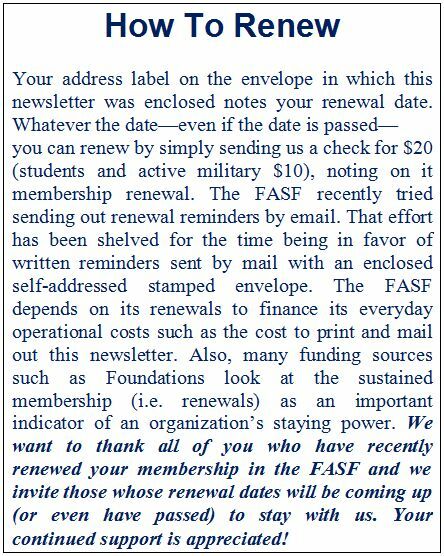 That very same year the FASF was founded to protect and preserve this historic site for future generations. Last fall, FASF founder and past-president Bill Wehner and his wife Mary McClain purchased the 160-acre parcel out of their own private resources for $35,200 and announced their intention to deed it to the FASF at their cost (with no profit whatsoever) once the FASF could reimburse them for what they paid for it. 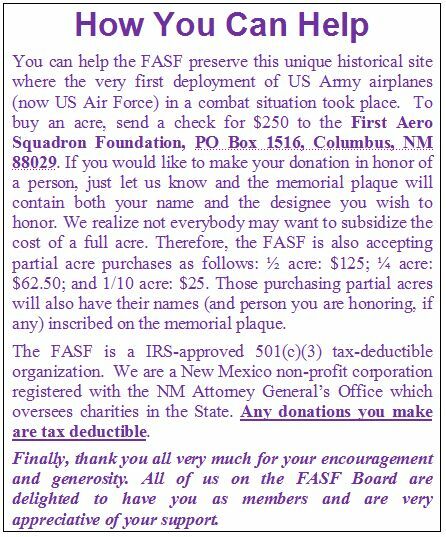 Almost immediately, FASF members started to mail in checks to help buy the historic land (see the following article: “Honor Roll of Donors”). Right now, the “Buy an Acre Campaign has raised over $23,000 and as the title of this article notes “We’re more than half-way there!” The organization is striving to raise the remaining $12,000 or so within 18 months. We are hoping you can help us meet that goal! The following is a list of “Buy an Acre” donors. Our newest donors (i.e. those whose names have yet to appear in an issue of The Aerodrome or those who have contributed additional amounts since their original donation) have the entry “NEW!”before their name. All donors will have their names and those of an honored person or persons memorialized on a plaque on the historic site. NEW! Requested to Remain Anonymous. Initially our anonymous donors purchased 20 acres with the pledge to match other donations with another 20 acres. Match was achieved and our anonymous donor purchased another 20 acres for a total of 40 acres! NEW! Requested to Remain Anonymous. One acre down plus pledge to purchase 4 more acres in 2014, in honor of “All Aviators Who Have Gone West.” 2nd acre has since been purchased. NEW! Experimental Aircraft Association (EAA) Chapter 555, Las Cruces, NM. NEW! Jim Davis, Sterling, VA, 1st acre with Steve Kelly in honor of Capt. Benny Foulois; 2nd acre in honor of Jim’s 3 grandchildren: Mathew, Jessica, and Jacob. Scott Schmid in memory of his Grandfather Lt. Coronal Earnest Francis Ewing, who was stationed in Deming during WW1. 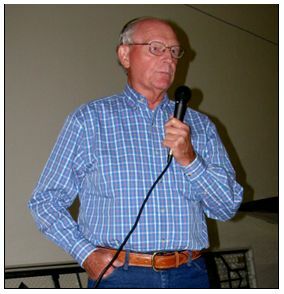 Scott is a FASF Trustee and lives in Deming. George and Rita Mock, Anderson, IL. NEW! Velvet Fackeldey, Lebanon, MO. 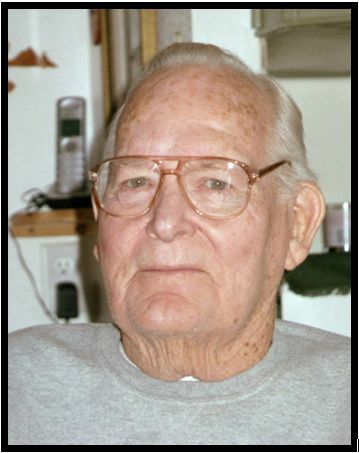 Gordon Maxwell died this past February. We didn’t hear of his death until we talked to his wife, Sharan, in late March. I thought about making an announcement at our annual retreat then realized that there was no one there, with the exception of Gene and Ric, who knew Gordon or what he stood for. Gordon and Sharan were established residents here long before Mary and I arrived over a dozen years ago. Retired from the California Highway Patrol, he and Sharan had become deeply involved in the local historical society. He had even been elected a village of Columbus trustee. Sharan was curator of the museum when I joined, and she took great pains to teach me all she could when I volunteered there. When I went to the two of them to discuss what role FASF might play in securing the airport property then being offered for sale by Mrs. Pat Walsh, Gordon immediately suggested that “we do the right thing”; that we solicit money from various individuals. In fact, he said, he and Sharan would be willing to put up $20,000 there and then. There was no discussion on who might be suing whom in the remote future, it was just the right thing to do. Lt. Col. Ira C. Cline, USAF, Dept. of Aerospace Studies, NMSU & CO of the AFROTC Detachment 505, Las Cruces, NM. In addition to the individual members who recently signed on with the FASF, our business and institutional membership also grew. The FASF is happy to welcome 1st New Mexico Bank of Deming as a new member. The FASF does all its banking at 1st New Mexico, which has a branch office in Columbus. Also signing up as an institutional member is the Village of Columbus. Columbus is an incorporated municipality. Its new mayor Philip Skinner is a strong advocate of economic development and historic preservation, which go hand-in-hand in attracting tourists and dollars to the border community of Columbus. Finally, Ivonne Romero signed up her popular restaurant and gift shop, The Pink Store in Palomas, Mexico, as a member of the FASF. FASF members Bill Madden and Fritz Wagoner are conducting an archaeological field survey of FASF land in order to more accurately determine the precise location of the U.S. Army aviation facilities as they were erected and employed following the attack on Columbus on March 9, 1916. Bill and Fritz are also members of the EAA Chapter 555 in Las Cruces. Before even getting out onto the land itself, Madden and Wagoner’s research involved studying maps from different periods hoping to reveal structures that were recorded but are no longer visible as surface features. The team also studied photographs, including aerial photos, from the period, contemporaneous accounts of the area, literary sources, research from historians studying the period and information from local experts. After putting together a plan based on the information that they had gathered, Madden and Wagoner systematically and methodically began fieldwalking in grids, searching for artifacts with the aid of metal detectors. To date they have uncovered a number of artifacts, both military and aviation-related, clearly from the Punitive Expedition era. These have been catalogued, photographed with their precise location noted through GPS. The field survey has barely begun but the results thus far have been very encouraging. One of the the Foundation’s goals is to rebuild the old Army Squadron’s hangars and other support buildings to as closely as possible replicate their appearance almost a century ago. Madden and Wagoner’s survey work will help provide a solid basis for achieving this goal. Note: The following article is by author and historian John L. Deuble Jr. Deuble, who is a member of the FASF Advisory Board, has graciously given the FASF exclusive permission to publish articles from his upcoming book in The Aerodrome. By John L. Deuble, Jr. When Camp Furlong was abandoned by the U.S. Army in 1926, many of the wood-frame buildings were dismantled and removed to Fort Bliss, Texas. The Camp Furlong Recreation Hall which underwent a major renovation in 1922 was closed for future use. This building subsequently served as the Civilian Conservation Corps [Camp Columbus] barracks during the 1935-1938 period. In 1956 it was an office for the U.S. Immigration Service. From 1974 to the present it serves as a Pancho Villa State Park community building. The adobe brick buildings within the camp [Regimental Headquarters, Judge Advocate General’s Office, and Officer Quarters] were surrendered to local environmental conditions. The camp airfield used in the 1916-1917 period had no permanent structures. When the wood and canvas airplane hangars were removed and shipped to Fort Sam Houston, Texas, all that remained was indistinguishable barren terrain. The airfield was never again used for military aviation purposes. In 2010 with the assistance of fellow First Aero Squadron Foundation member Dr. Roger G. Miller, the author determined the location of the 1st Aero Squadron Airfield. Through the use of a map prepared by soldiers of the 2nd Massachusetts Infantry Regiment – National Guard and a map prepared by the camp’s Engineer Field Depot, the nominal rectangular airfield was located on a current USGS topographical map. The military maps which were prepared at Camp Furlong were from the September to December 1916 time period. 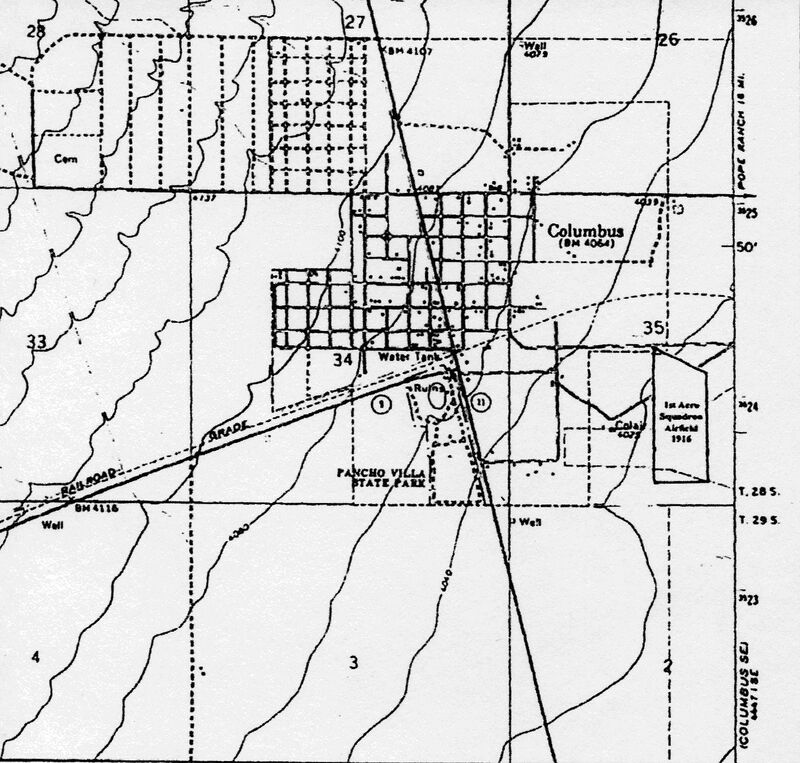 Key 1916 datum points used to locate the airfield included: (1) the intersection of the Deming-Palomas Road with the El Paso & Southwestern [EP&SW] railroad tracks; (2) the EP&SW water tower immediately north of the Columbus Railroad Station; (3) the intersection of Lima and Boundary Streets on the north side of the EP&SW railroad tracks; and (4) the Hoover Hotel at the southeast corner of Broadway and Boundary Streets. As shown on the following page, the airfield was southeast of the Village of Columbus and east of the main portion of Camp Furlong…. After the 1st Aero Squadron departed Camp Furlong in August 1917, growth potential for the camp did not develop. During World War I Camp Furlong was a candidate for a national cantonment [temporary training facility]. It lost to Camp Cody in Deming, New Mexico. This was the largest military post in the state during World War I. It processed 30,000 troops during its forty-two month period of operation. These soldiers were from National Guard units from Minnesota, Iowa, Nebraska, North Dakota and South Dakota. During World War I Camp Furlong was manned by the 12th Cavalry and 24th Infantry [Buffalo Soldier] Regiments. They patrolled the 125-mile border between Noria, New Mexico [east] and Culberson’s Ranch [west]. [Culberson’s Ranch is now Antelope Wells, New Mexico, a Border Authority point-of-entry.] When the Influenza Epidemic of 1918 reached Camp Furlong, the post incurred forty-eight deaths [12th Cavalry – twenty-three, 24th Infantry – nineteen, and Camp Medical Detachment – six]. Approximately six earth fire pits [six-feet wide by six-feet long by six-feet deep] were used to burn the bedding and clothing of the deceased Camp Furlong soldiers. In the post-war period, the camp lost a position within the Aerial Border Patrol during the 1919-1921 period. To the east the El Paso District manned the Monument 40 Patrol [Fort Bliss to Hatchet Ranch, New Mexico] while the Arizona District manned the Douglas Patrol [Hatchet Ranch to Douglas, Arizona]. During this period Camp Furlong accommodated emergency landings in January and July 1920 for aerial patrol DeHavilland DH-4 airplanes. However, the 24th Infantry parade/drill field was used as the landing field – not the former 1st Aero Squadron Airfield. The above article was reprinted with the author’s permission from the following sources: John L. Deuble, Jr. Camp Furlong – Columbus, New Mexico 1912-1926 and John L. Deuble, Jr. 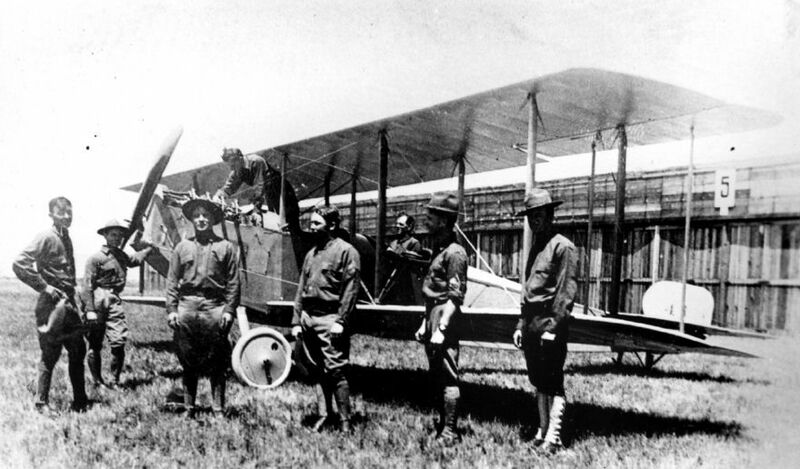 The 1st Aero Squadron 1913-2013 – A Century of Military Aviation Leadership and Service. Note: A complete bibliography accompanied this article. It is available on request. Hey You Fellows, I really like your style! I enjoyed opening my mail the other day with the enclosed decal and patch. I like the envelope and the Logo. This is the only letter in a very long time that I was moved to save. Thank You. Keep up the great work and the Smooth Style. Thanks, I’m a new member. Bruce D’Salas, Columbus, NM. our project. Wonderful to have you aboard!